Enjoy at least 12 Islands. This voyage is a mixture of active but comfortable sailing. The world you’ve discovered is a wonderfully unique Caribbean Paradise. It’s as if you had your own chartered yacht and could sail anywhere you wanted. Except we do all the work for you while you laze in our pool, or watch the dolphins play in their pool. Royal Clipper explores the lush, exotically beautiful islands like Dominica and St. Lucia, where jungle trails abound with sweet-smelling vanilla orchids and other wild-growing tropical flowers and visits privileged enclaves in the lesser-known Grenadines. Smaller ports like Iles des Saintes, offer an intimate Caribbean experience. A cruise aboard Royal Clipper is the perfect platform from which to launch diving adventures in the Tobago Cays, where the reefs are a marvel of colourful marine creations. Royal Clipper sails from Barbados on alternating voyages to explore the Spice Islands of the Grenadines or the Windward Islands. The Caribbean venues where Royal Clipper sails are famous for their glorious sailing weather, and every voyage promises the thrill of passagemaking under full sail. Barbados is an island, northeast of Venezuela and about 100 miles into the Atlantic Ocean. It is an island nation located towards the east of the Caribbean Sea and in the west of the Atlantic Ocean, part of the eastern islands of the Lesser Antilles, with the nations of Saint Lucia and Saint Vincent and the Grenadines being its closest neighbors. The picturesque island of Tortola offers pristine white-sand beaches, lush green mountains, and sheltered yacht-filled harbors. The dramatic shape of the island Virgin Gorda reminded Christopher Columbus of a reclining woman, so he named it Virgin Gorda, the "Fat Virgin". Named the “Drowned Land” by the Spanish, Anegada is the only coral island in the volcanic BVI chain. Home to fewer than 300 inhabitants, Jost Van Dyke is rich in folklore and renowned to be one of the most friendly and welcoming islands. 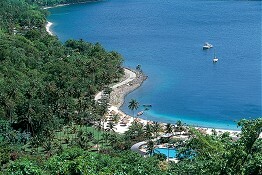 Rodney Bay is just a few miles from Castries, the capital of St. Lucia, on the northwest coast of the island. The 80-acre man-made lagoon is named for British admiral George Rodney, who sailed the English Navy to attack and decimate the French fleet in 1780. At adjacent historic Pigeon Island, connected by a causeway to the main island, you'll see the ruins of Admiral Rodney's naval station, and a beautiful park filled with tropical trees and flowers. You can enjoy exploring the ruins, and go swimming or snorkeling from the pristine white beach. In Rodney Bay you are likely to see the tall ship Unicorn, which filled the role of a pirate ship in the movie Pirates of the Caribbean, along with another brig, Lady Washington, now returned to Puget Sound. You can sign onboard Unicorn for a day's pirate cruise along the west coast of St. Lucia, an adventure that includes a treasure hunt, a raid on the Botanical Gardens, and live cannon fire. In the marina you may see some of the large ocean-going yachts which compete in the annual Trans-Atlantic race which ends in Rodney Bay. Swim and snorkel from a long, lovely curving beach, or go water-skiing, dinghy sailing, even SCUBA diving, with the help of your ship's water sports staff.